Not so long ago we told you some details about the upcoming Outlast DLC, entitled Whistleblower, and already today we are ready to announce the release date of this add-on and to show you its new screenshot. Thus, if you eagerly anticipate the launch of this add-on, then we are glad to tell you that Outlast DLC release date is scheduled for the beginning of May, i.e. on the 6th of May in North America (for PC and PS4) and in a day in Europe. Earlier, if you remember, this add-on was planned to be released in April, but its developers decided that there are some game’s moments that should be polished, and so they delayed its launch, but only for a couple of weeks. Besides Outlast DLC release date, Red Barrels has decided to please the fans by presenting the fresh add-on’s screenshot, which is really scarry. 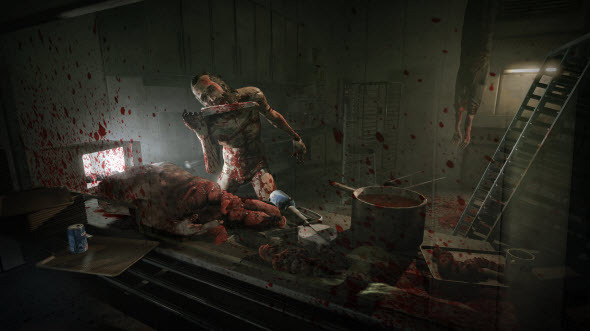 There are many pools of blood everywhere, the bodies, the cutting tools, some psycho - all as it should be in a good game, developed in the genre of survival horror. So look at, appreciate it and do not forget to leave your comments about the picture, this news and the add-on in general.